R&R open end "glueless" Lug Nuts attach to the wheel with springs for FASTER pit stops. Pit Stop USA is The Online Motorsports Superstore! 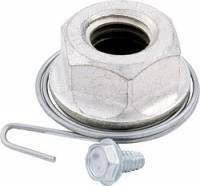 Manufactured by R&R open end Lug Nuts attach to the wheel with springs for FASTER pit stops! Kits contain 5 glueless lug nuts with springs attached and self-tapping screws for mounting. We feature R&R Glueless Lug Nuts at low everyday prices.